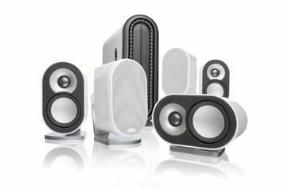 BRISTOL SHOW 2011: SIM2 and Anthem AV join forces to present the "ultimate 3D experience" | What Hi-Fi? BRISTOL SHOW 2011: SIM2 and Anthem AV join forces to present the "ultimate 3D experience"
Once again Anthem AV has teamed up with SIM2 to create a pair of state-of-the-art home cinema systems. The lifestyle system uses Paradigm reference MilleniaOne satellite speakers and MilleniaSub (pictured), teamed with brand-new Anthem MRX receivers and Anthem Room Correction. For the "ultimate 3D experience", the main cinema demo features the new SIM2 C3X Lumis 3D projector combined with Anthem Statement and Paradigm Reference electronics. New product launches at the show include the Anthem MRX 300/500/700 multichannel receivers, the Paradigm Reference MilleniaOne sub/sat speaker system and Paradigm PDR-W100 wireless subwoofer. For more info on all the new launches, demos, competitions and prizes at this year's Bristol Show (February 25-27th), see our preview blog.